Getting press is uber-important. A single story in a top publication can make or break your fledgling business. But getting rejected, ignored and overlooked hurts. And wastes your precious time. Does this mean you should hire a PR firm to pitch journalists? A PR firm doesn’t know you or your business. Plus, with monthly retainers of up to $10,000, they cost a boatload of money your young business doesn’t really have. The truth is that anyone can do PR. For all its mysteries, PR is a relatively straightforward business – you invest in relationships, find the right angles, and send a stellar pitch. Do that and you can land a spot on any top publication, even if you’re an absolute nobody. What not to do when pitching press. This doesn’t work. Generic, catch-all email addresses are usually inundated with pitches. Unless you have a story about Amazon acquiring Facebook, your pitch will go unnoticed. A better approach is to target specific writers at each publication. Plus, this gives you an opportunity to personalize your pitches. And personalized emails are 26% more likely to be opened. An email written for 100 people will work for 0 people. It’s not personalized, and people can smell a cookie cutter email a mile away. But personalizing your message is only the first step. You need to follow this next uber-important rule, too. A “beat” is a journalistic term for a journalist’s area of focus. These can be broad (“technology”) or narrow (“mobile payments”). Industry-specific publications usually cover narrow beats. 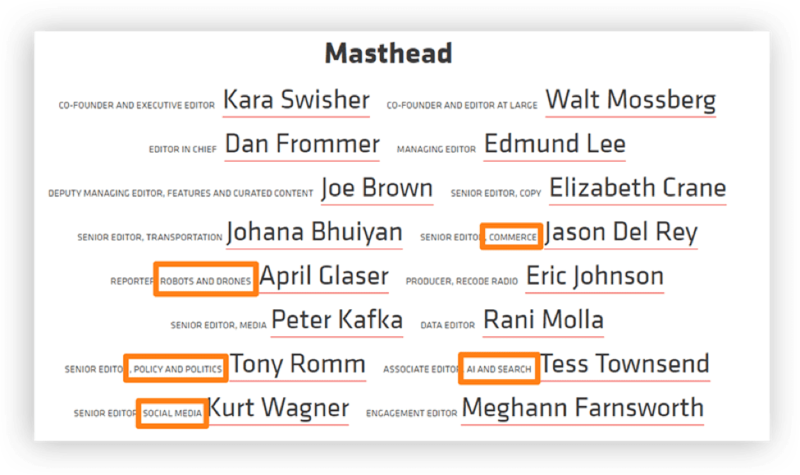 Recode.net, for instance, has separate editors for robotics, social media, AI, commerce, etc. Publications like HuffPo or NYTimes, on the other hand, will have a single editor covering a broad beat (such as “politics”). For these strategies to work, you need to target the right beat. Don’t send a story about your AI startup to an editor who only covers e-commerce. With the fragmented nature of news desks today, there’s a good chance your pitch will never be forwarded to the right editor. 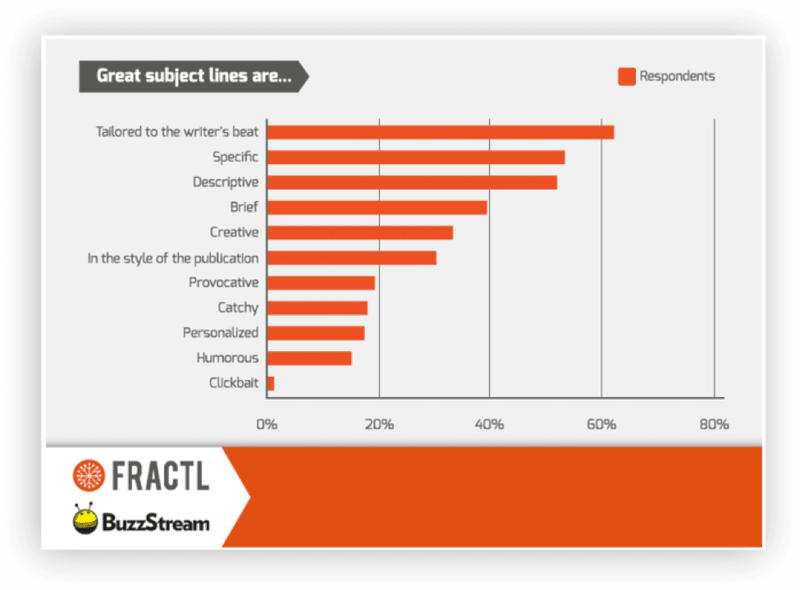 One survey by Fractl even showed that 60% of writers want pitch subject lines to align with their beats. It’s super-important to target the right beats, otherwise you’ll just waste your time. You can find a journalist’s beat by looking at the publication’s masthead (journalism term for “about” section). Most will also mention their area of coverage on their Twitter. 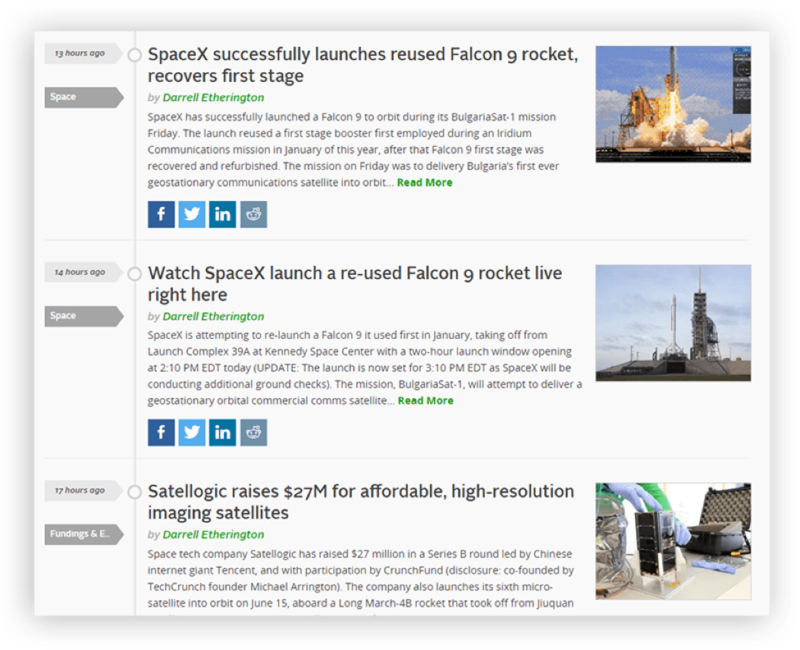 Alternatively, you can use a tool like JustReachOut to look-up journalists who cover your topic based on their past work. While following the first two rules will make pitching easier, your PR success will ultimately depend on whether you follow this critical third rule. PR is highly personal. You don’t just reach out to press contacts when you need them. Instead, you should build long-term relationships with them. In a way, it’s a lot like sales. You must consider what the end users (here, journalists) need, nurture your relationship with them, and when the timing is right, send them a personalized pitch. When you embrace this relationship-first ideology, you’ll never struggle to get press. With these must-haves out of the way, let’s take a look at the pitching process and some attention-grabbing media pitch example emails. An angle that piques their curiosity. A short, crisp email that instantly gives them value. Let’s cover each of these now. Combine all three and you have a pitch that won’t be ignored. Let’s move on to approaching the journalists. I find this to be nerve wracking for some, but that doesn’t have to be the case. Find a recent story the journalist has covered and relate your product or content to it. The idea here is that if a journalist has covered this same topic in the past, he might be interested in covering it again. Your story has to align with the writer’s beat. Your story should relate to a recent story. Go through your target writer’s last few articles. Ask yourself: what’s common between these stories? How can I relate them to my business? Notice they’re all related to space. If you had a tech product connected to this industry, Darrell would probably be interested. What if you don’t have a related news story? In that case, you’ll love the next angle. 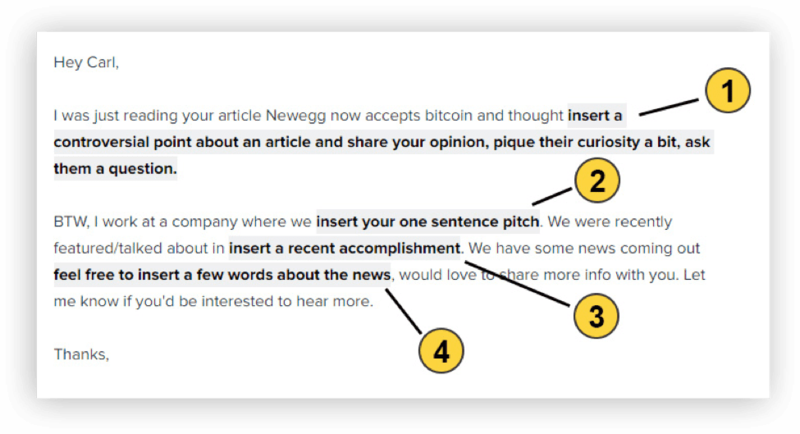 “Newsjacking” is when you piggyback on a big news story and tie it to your product. It’s now become a standard play in PR but was a groundbreaking approach when David Meerman Scott first used it. Large brands tend to use this approach all the time but it also works well for smaller businesses too. The key to making this work is to target media outlets that cover the news topic only incidentally. For instance, if you’re writing about the business lessons from the latest Kardashian scandal, don’t approach People magazine. Approach Forbes instead. Focused on something they covered – business. 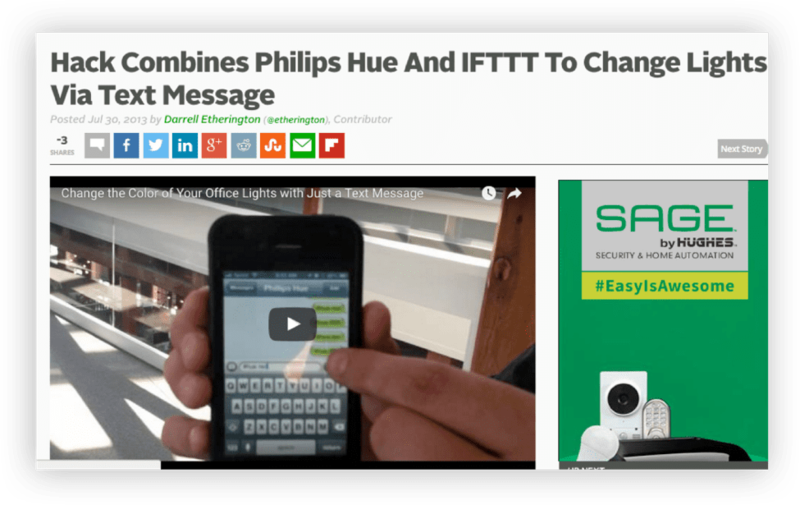 As a result of the article, Hiro’s site saw a 200% increase in traffic and a 300% increase in conversions. Newsjacking works spectacularly, but isn’t always possible to pull off. If that’s the case, this next strategy offers an evergreen solution. Everyone is looking for more traffic these days. And if you can offer something that will potentially get a lot of traffic, journalists will definitely perk up. But how do you prove that a story will generate traffic? Simple: show the journalist you’re pitching how a similar story performed well in the past. And back it up. Find a story that has performed exceptionally well in the past. Create content related to this story or tie your product to the story. Pitch your story, referencing the older, well-performing story. 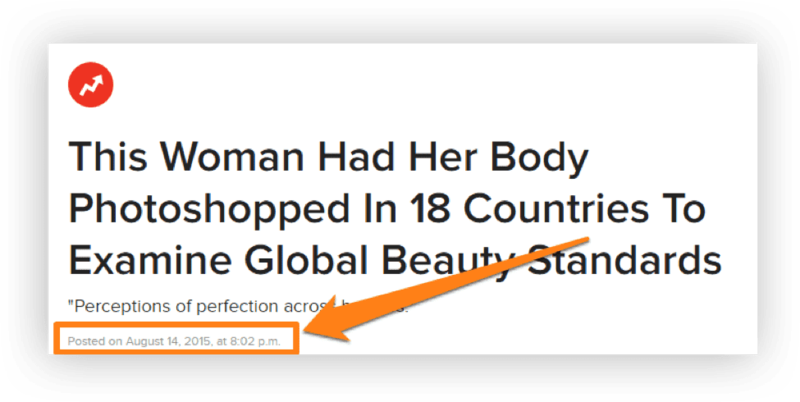 In August 2014, Buzzfeed featured a story about a woman whose face was Photoshopped in 25 countries to show the current global beauty standards. This story was heavily shared across the web (the original page has over 70 linking domains). A year later in August 2015, Buzzfeed featured another story from Superdrug.com. This one had 18 freelance artists from 18 countries Photoshop a woman’s body, again, to show global beauty standards. The result was over 700,000 views and 900,000 shares. The current page has over 1,000 referring domains. This is the perfect example of “storyjacking.” Find something that worked and use that as a reference to craft your content. Your pitch angle is crucial, but what bothers most people is actually writing the email. 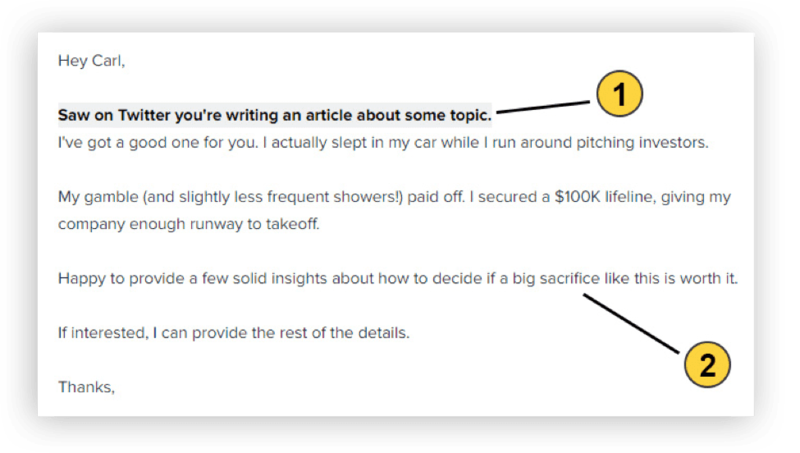 I’ll show you how to craft winning emails in the next section, starting with the subject line. Your story might have a great hook, but if journalists don’t even read the pitch, it won’t do you any good. This is why you need to spend time crafting the perfect subject line. In fact, two-thirds of journalists decide whether to open an email or not based on the subject line alone. I took the last 6 months to research and compile a big list of the best email subject lines and email signatures to use when pitching media. But these powerful examples are from the perspective of businesses emailing their subscribers, not marketers cold emailing journalists. The latter requires a different approach altogether. The most in-demand content formats are visual in nature. Lesson: stand out by telling journalists that your content is visual right in the subject line. In fact, Fractl’s Kerry Jones mentions that visual content contains the two “magic words” that almost guarantee your email will be opened. The content should include plenty of visuals, including an infographic, to give publications something to share with their readers. What if you don’t have any visual content to share? Does that mean your pitch is destined to end up in the trash? Hardly. 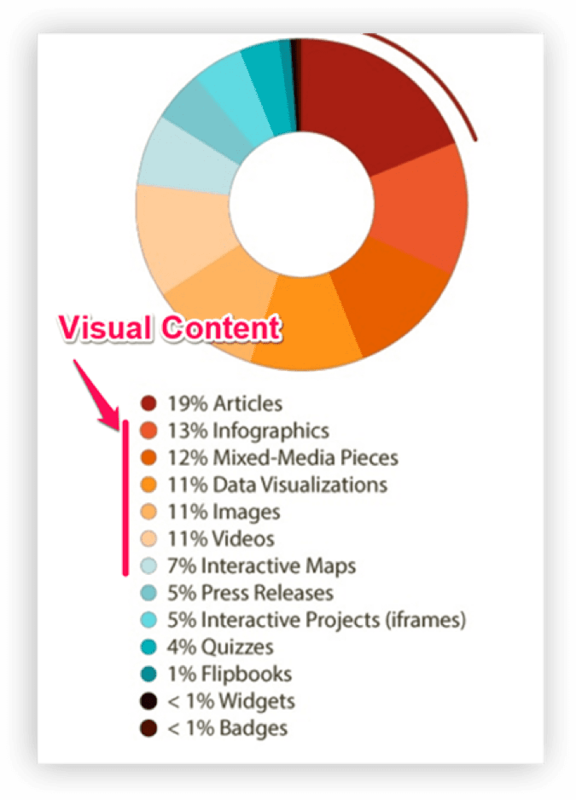 While visual content is great to have, it’s not necessary for pitching the press. There are other strategies you can try instead, such as the one shared below. Unless you’re personalizing the pitch heavily (which is great, but not scalable), use your content’s title as your subject line. This might come across as low-effort, but most journalists at large outlets actually prefer it. It tells them exactly what the pitch is about and leaves the guesswork out of coming up with a compelling headline. Note that this works best when you’re cold pitching a story to a large news outlet. It doesn’t work quite as well when emailing influencers, building relationships or approaching smaller outlets. So use it when emailing WaPo, not TechCrunch. A great subject line is powerful, but as I’ll show you next, personalization is even better. Tier-1: Writers, bloggers and influencers who either work for, or are themselves recognizable by their names. 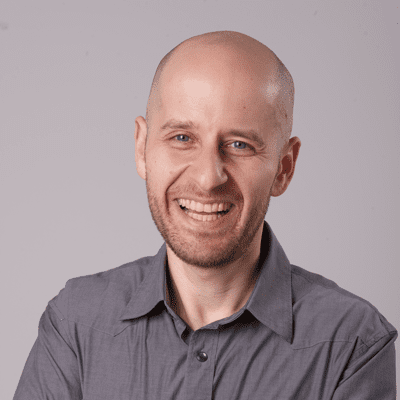 Think TechCrunch (tech), HubSpot (business), Derek Halpern (marketing), etc. Tier-2: Writers, bloggers and influencers who are respected, but don’t have the influence and reach of tier-1 folks. Think ReadWrite.com (tech), Close.io blog (business), etc. Instead of looking at hard metrics (follower count, domain authority, etc.) to build these segments, ask yourself: what publications do you want to get featured on the most? The answer would make your ‘Tier-1’. 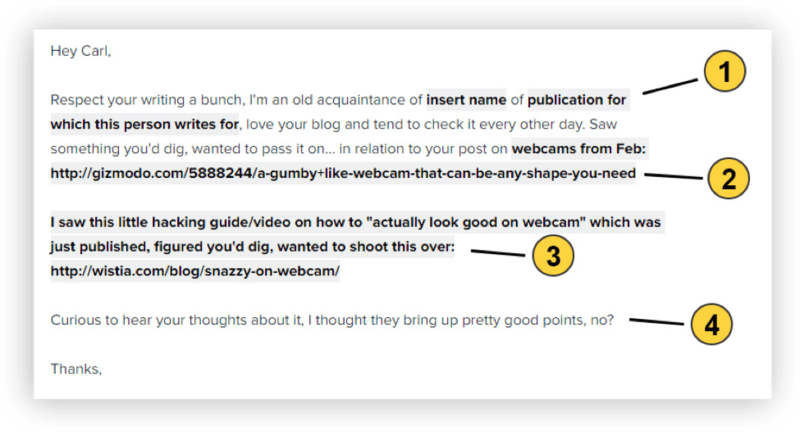 For all Tier-1 journalists on your list, personalize the subject line to something that is relevant to the journalist. Something the journalist shared on Twitter recently. The journalist’s last few stories. Ego-bait based on the journalist’s work. I’ll share a few examples of these below. All great pitches have three characteristics. Relevant to the journalist (even if they are not personalized). Highly readable, i.e. they use short sentences, bullet points, subheadings, etc. Here are some actual examples and templates to help you do just that. Send these types of emails anytime you want to develop a relationship with a journalist or influencer. Since the objective is to build a relationship, don’t include a salesy or strong CTA. The “appreciation” email where you show your appreciation for the journalist’s work. The “helpful” email where you correct a typo, share relevant content or introduce the target to someone or something that might help them. Appreciation emails work best on first touch when you just want to register yourself on the journalist’s radar. 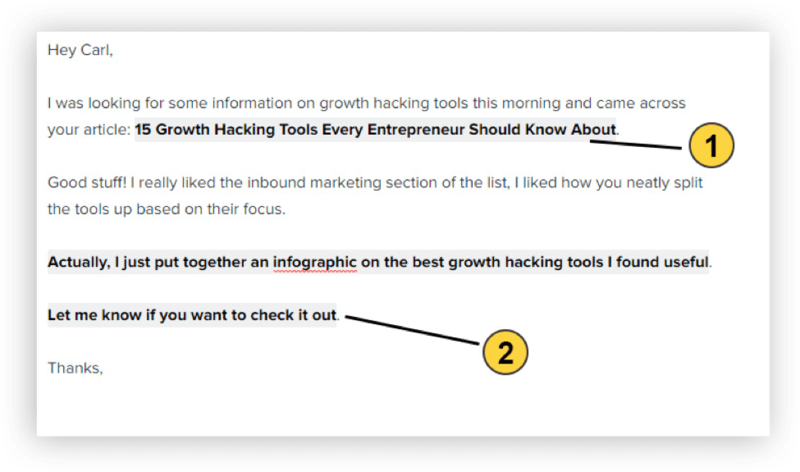 Helpful emails work better as second or third touch points with high-value contacts. What you ask for will depend on how much you give in the email. If you just corrected a typo, don’t expect your reader to invite you in for an interview. But if you introduced Rand Fishkin to a VC investor, you may see a tweet out of it. Here are a few examples of these emails. Note: all the personalized sections are highlighted in bold. You’d think that pointing out typos might make you sound like your 7th grade English teacher, but writers who care about their craft will actually appreciate it. The trick is to adopt a helpful, not antagonistic tone. At the same time, use the opportunity to move the relationship further by asking a relevant question. Don’t beat around the bush; point out the typo in their article, then expand on it in the email body. It’s simple, yet effective. Remember, the highlighted bits are personalized for each recipient. Point out something related to their recent article. This shows that you actually read what they publish. Point out the typo(s). If there are too many, point out just a couple at most. Close with a leading question that allows you to continue the conversation. Asking what they are working on next is a good place to start. It gives you an opportunity to share something relevant or even plug your own content. It might feel pedantic, but correcting typos can actually get influencers to respond. If you can’t find any typos to correct, you can use this next relationship-building email. With this type of email, you share content with the journalist related to their recently published work. Highly relevant to their previous work. Obscure enough that they might not have read it themselves. An interesting or controversial take on the topic also works well. Refer to their recently published article. Don’t go overboard with curiosity gaps and power words. A simple subject line like this looks a lot less spammy and is much more likely to get read. This email feels like a fan sharing something relevant, not a marketer trying to push his agenda. The easiest way to get a journalist to drop his guard is to mention someone they know and trust. This might not always be possible, but if you have a mutual contact, refer to them right away. This should be obvious enough – include a link to their published article. This next one is a little trickier. You want to share relevant content, but you also don’t want it to sound like you’re pushing your own work. Pick a respectable source and make sure that the shared content has a relevant, interesting take. Close with a simple question. You won’t always get a response, but it does the job of registering your name on their radar. 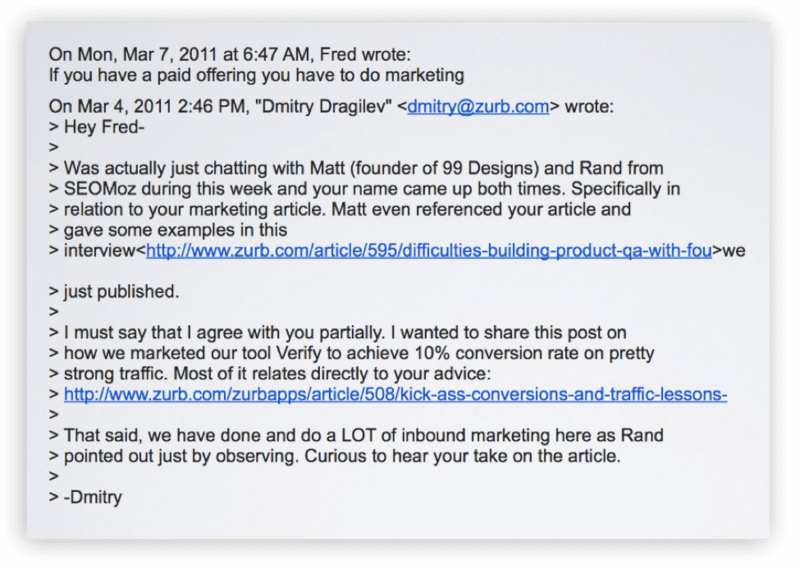 For example, here’s a message I sent to Fred Wilson in reference to his post on marketing. If you’ve exchanged messages with a journalist in the past, you can be much more casual in your email. I’ll show you the payoff from these conversations in the next section. Sharing relevant content is great, but if you really want to hit the bullseye, try this next relationship-building email. The idea with this email is simple: follow an influencer’s advice and share the amazing results with them. Helps their brand if they can publicly share how their advice helped someone else. Makes them feel good that their advice generated results. Email every influencer whose advice you’ve followed. Again, we’re keeping things simple. Show genuine appreciation instead of messing around with complex wordplay. Use generic results if you’re targeting a category of journalists or influencers (say, “fitness bloggers”). If you have specific results from following a specific influencer’s advice, use that in the subject line when mailing this influencer (“lost 20lbs with your diet!”). Change this to the age of the blog (or howsoever long you’ve been reading it). 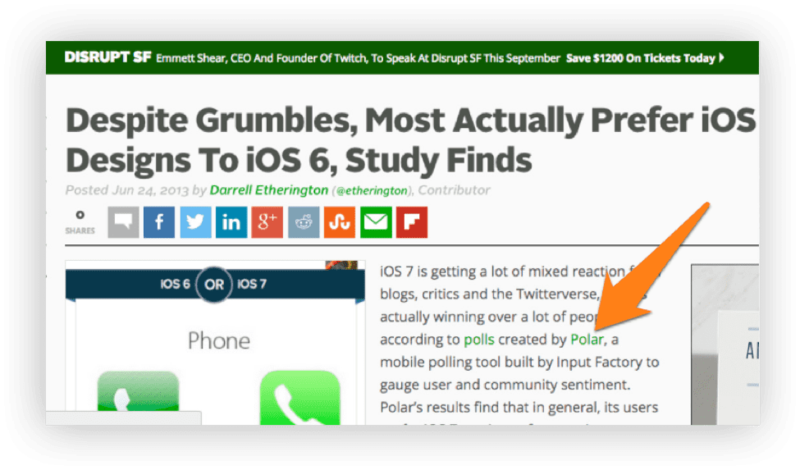 Don’t use the exact headline of the article (that makes you sound like a spammer). Instead, paraphrase the headline (“5 Secrets to Creating an About Page” -> “creating a great about page”). Share your results. This example has a generic result (“reduced stress levels”) but exact results – if you have them – work better. 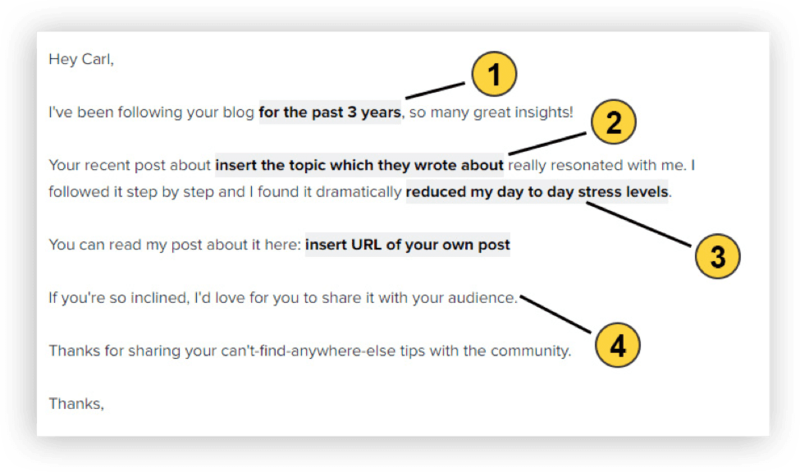 If you’re using this purely for relationship building, skip the CTA at the end. Building relationships is one part of the PR equation. The next part is sending attention-grabbing PR emails, like the ones shared below. PR emails come in a variety of flavors. Some are designed to get backlinks from influencers, others to get your stories published in media outlets. Mention something the journalist wrote about recently. 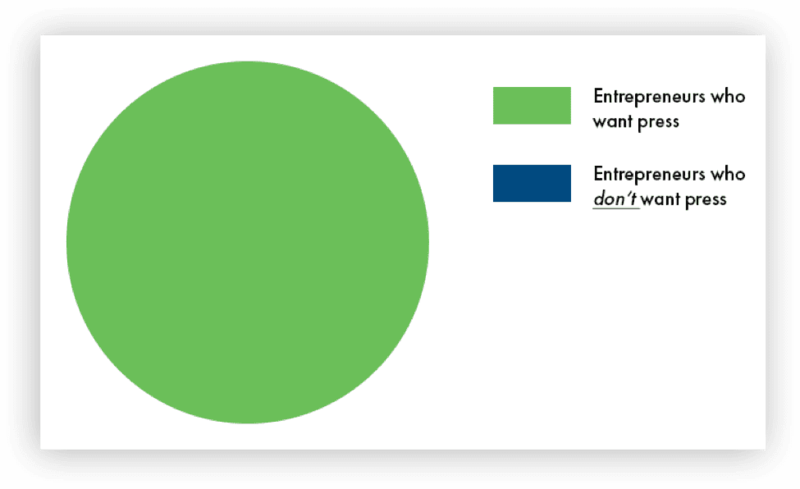 Relate it to your content/product/business. The secret is to personalize just enough to make the email sound like it was custom written, not mass emailed. Of course, it helps if you already have an established relationship with the target (especially when emailing tier-1 journalists/influencers). 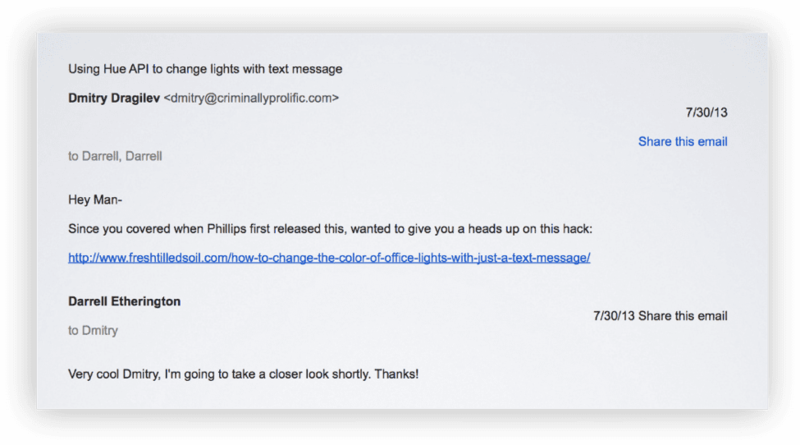 Here are a few PR email templates that have worked for me in the past. 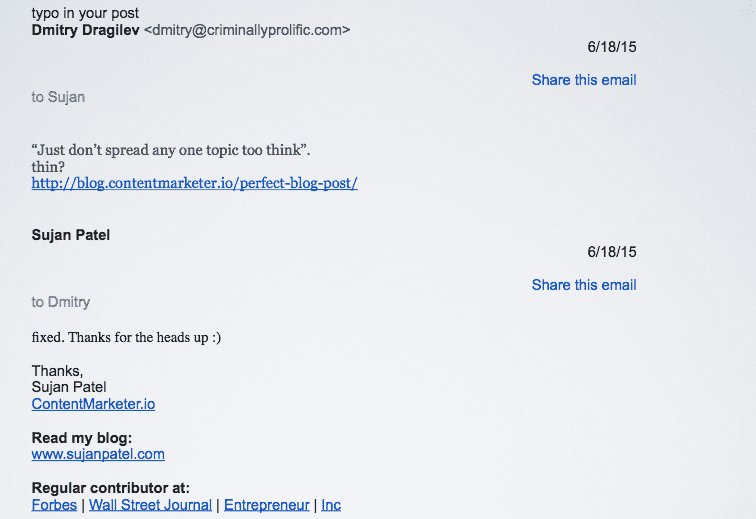 See this post for a general list of tips for better PR emails. The idea behind this email is to refer to the journalist’s recent story, then use it to plug your product pitch. Add some personalized comments to make the email sound more authentic. Keep things simple by simply referring to their recent work. This keeps their guard low and compels them to at least open the email. This type of email works best when you’re targeting professional journalists (as opposed to influencers) who are used to getting email pitches. The first paragraph is completely personalized. The second paragraph, however, only has little personalization. 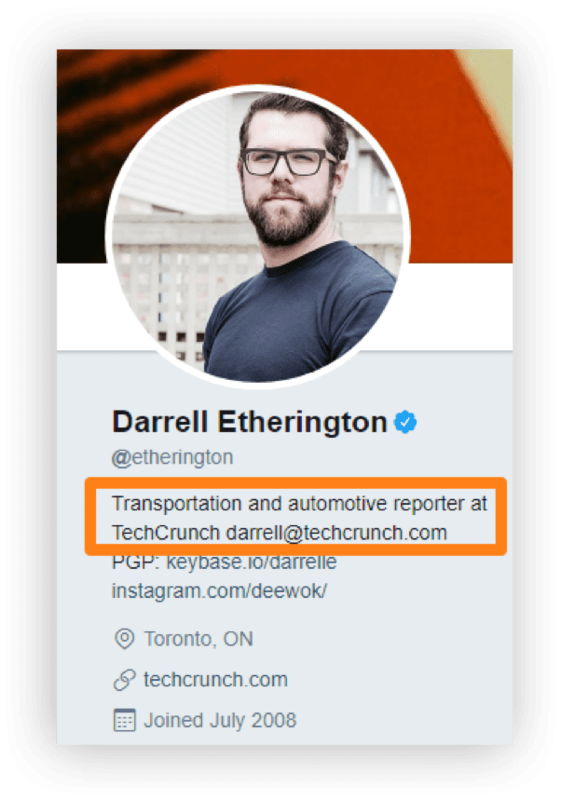 Because of this, you can use the same company pitch on more than one journalist; you just have to personalize the “recent accomplishment” to fit the right recipient. This is an important step that you’ll want to double and triple check! Make sure that your comment or question is probing, authentic and intelligent. A generic “great article!” comment just comes across as spammy. The recent accomplishment doesn’t have to be related to the article in question, but it will definitely help. Expand on the recent accomplishment here. Tie it to the article in question if you can. Notice that the email doesn’t close with a big request. It merely asks the journalist if they want to know more. This avoids the problem of long emails (which journalists hate) by breaking down the pitch and the actual content into two separate emails. Send the content only if the journalist gives you the go-ahead. Remember the email I sent to Darrell in the above example? Since I had already exchanged messages with him before, he actually took the time to read my email and value proposition. This is the 1-2 punch of a relationship-building + PR email. What if you have any specific content formats to share? In that case, the next email would be perfect for you. Here’s an email for pushing out an infographic to the press. Clear and precise works better than obscure and convoluted. Except for the second paragraph and the article title, there is little personalization here. This is because getting infographics in the press is a volume game. If you start personalizing every email, you’ll never hit scale. Refer to their article title, then add a line or two on what you like about it. This makes the email feel more personalized. Inform them about your infographic. Instead of sending a link, ask them if they want to know more. If the target responds in the affirmative, send them a link to the infographic. You can also offer to write a custom introduction to make publishing easier. This two-step process works better than writing a long single email. Plus, you can mass mail the first email and only bother with personalization for targets who respond positively. Although infographics are nice, the best way to get into major publications is by sharing original research. The next email is perfectly suited for this task. Exclusive research and data is a great way to get press. Not only do journalists love it, but it’s also hard to do which keeps spammers away. This subject line uses the magic word “data” which piques the reader’s curiosity. It also uses the word “juicy” to show that you have something interesting to share. The “interested?” interrogative makes the subject punchier. 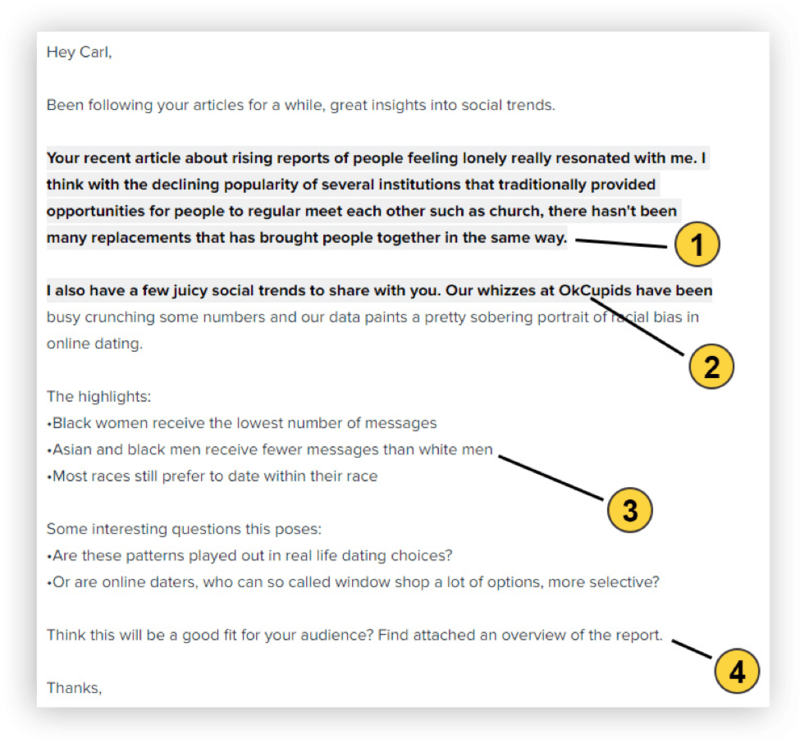 This works perfectly with the controversial topic of the research – what journalist wouldn’t be interested in data about racial bias in dating? This might seem rather long, but when you’re trying to get journalists interested in original research, you need to have plenty of depth. You need to state your credentials, your most interesting findings and your methodology. This email, despite its length, only has a single personalized paragraph. The rest of the email can be used as is. This personalized paragraph makes a reference to the journalist’s recent work. You can then use this reference to plug your research. This paragraph gives a brief overview of “who” conducted the research. OKCupid is a recognizable brand name, but if you’re pushing an unknown brand, you might have to talk up the credentials (like: “original research on driverless cars from former Google exec”). Lay out the juiciest details from the research. The more controversial, the better. The CTA asks a rhetorical question, then plugs the report. You can divide this into two separate emails as well (like in the template above). Sometimes, instead of pitching to the press, journalists solicit ideas and content for their stories. This next email will show you how to respond to such queries. So you found a top journalist publicly asking about a topic on Twitter. How do you respond to such an open request? Again, we’re going with a personalized, conversational subject line. Your only concern is to ensure that it’s related to the topic the journalist asked about. This email is based on a specific find on Twitter (or any other public channel). As such, it is tailored to only one recipient. You can’t really scale it. Refer to their question on Twitter in the first line. This grabs their attention and tells them that you have something relevant to share. Share your story. For this to work, share a) what you did, and b) your results. Be as succinct as possible. Make sure to include the juiciest details (here, “sleeping in a car” and “$100k lifeline”) to get them interested. Close by asking them if they want to know more. If they bite, share the rest of the story. 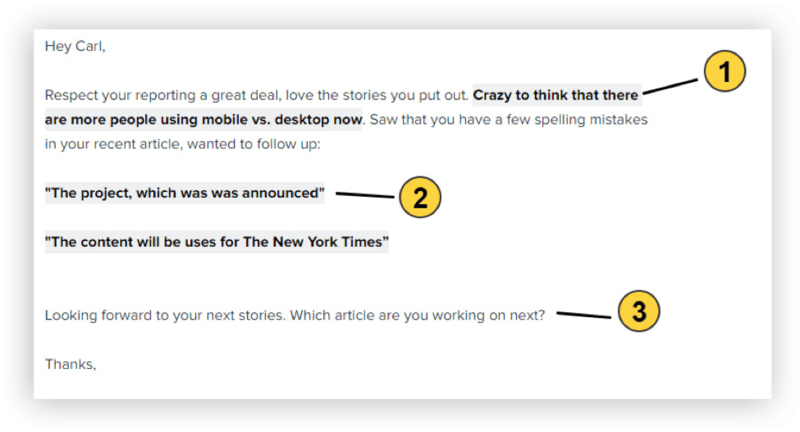 In the next email, I’ll show you how to get stellar results by relating your product to a journalist’s recent story. Here’s another way to leverage a related story to plug your product. Unlike the subject lines I’ve shared earlier, this one is much more provocative. The reference to the journalist’s recent work is oblique, but the compelling story angle makes up for it. What journalist wouldn’t be interested in a replacement for all food? If you have a groundbreaking product, try adopting this approach. Make a sensational claim in the subject line, then back it up in the email body. This email follows a familiar pattern: a) mention the journalist’s recent work, and b) relate it to your product. You’ll notice that the only part you actually need to personalize is the first paragraph. The rest of the email can be sent as-is to any number of contacts. Use the first paragraph to offer comments on the journalist’s recent work. You don’t have to have groundbreaking insight; you just need to be personalized enough to not appear like a mass spammer. This is your main product pitch. Your product’s primary benefits. Change these based on the publication’s target audience. 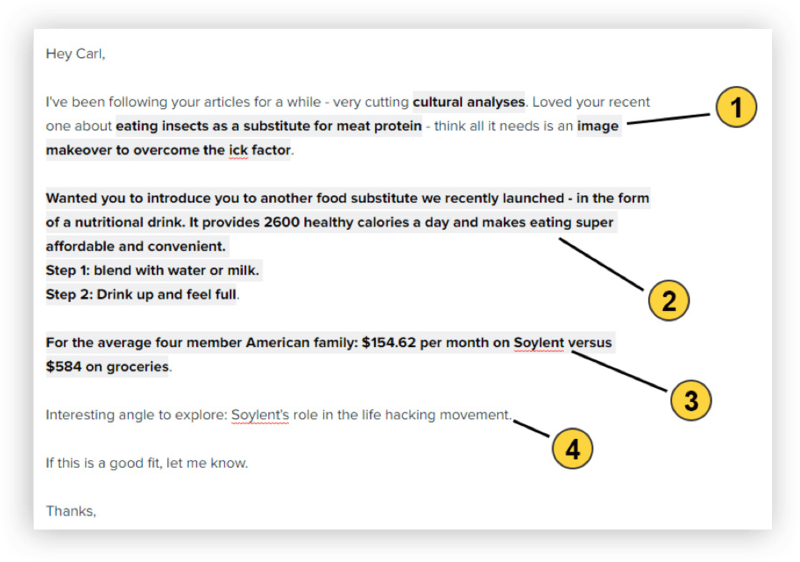 For example, you might focus on the time saving benefits of Soylent when pitching to a magazine for entrepreneurs. For a magazine read by housewives, you might push the health benefits and cost savings instead. (Optional) Pitch an angle the journalist can explore. Change it for the journalist or publication’s focus. If your target journalist has written extensively about life hacking, for instance, you can pitch that angle here. Close by asking if the journalist wants to know more. If they reply in the affirmative, send over the rest of your content. PR can feel a lot like wizardry from the outside. You might even feel that you need a magically compelling story and some incredible networking skills to get any press. It’s no wonder why so many businesses don’t attempt PR at all, or hire expensive PR firms. But the truth is that getting press is a super simple process. Develop relationships with journalists and influencers. Plug your story in a way that is relevant and timely. Luckily, with these media pitch examples, you really have no excuses to let your PR game go unnoticed. You don’t even need any fancy tools to get started; a spreadsheet and an email account is all you need. Begin with building your contact list. And when you’re done, send them one of these emails. And I’ll see you on Forbes and TechCrunch soon! Glad I came across this article. I was writing my first media pitch and your tips came in super handy! Thanks. Thank you for this article! It was comprehensive and very helpful. This was very valuable. I wish I could have this in a reference book. Definitely booked marked this article to my tool bar. Thank you so much!